Team RWBY is assembled!! Yang Xiao Long joins the fight in BlazBlue Cross Tag Battle!! Blanka rolls into Street Fighter V: Arcade Edition!! 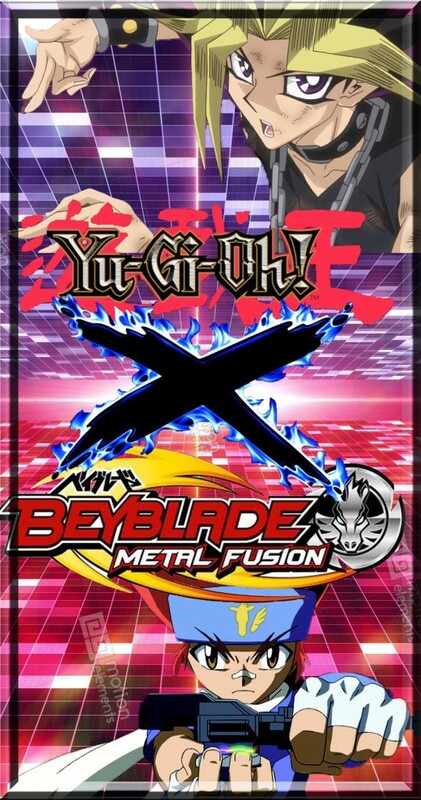 Yu-Gi-Oh X Beyblade Chapter 6 Pt.6!! Ferrah follows suit, launching her Beyblade into the stadium. Sagittario and Silver Scarab circle the stadium. Kenta stares fiercely at Ferrah who gazes back with a wicked grin. When he started out beyblading, Kenta did have much confidence in his skills until he met Gingka. Through Gingka and the friends he has made along the way, he now has far more confidence than before. He believes he can win this battle. He has to, for Madoka’s sake. In the barrier, Madoka has taken out her minicomputer and is using to examine Ferrah’s Beyblade. Aznu, Honda and Jonouchi look over her shoulder while she explained the data she discovered on Silver Scarab. “Silver Scarab appears to be an attack type and its ball point performance tip gives it more freedom of movement,” she tells them. “Oh I see,” says Anzu. Jonouchi and Honda stare blankly at Madoka, clueless as to what they had heard. Madoka sees this and helps them better understand. “Oh! I’m sorry. I’m used to telling this to Gingka or the others. Kinda forgot you aren’t from here,” she said sheepishly, rubbing the back of her head. “Nah, it’s cool. But, uh, could you dumb it down for my friend here? He’s not too quick on the uptake,” Honda says, pointing at Jonouchi. “Oh don’t even act like you got all dat!” snapped Jonouchi. Madoka laughs lightly, finding Honda and Jonouchi to be quite humorous. “Basically what this means is that Silver Scarab can move very easily to launch quick attacks. But having that smooth performance tip also makes it easier to knock it back. So if I had to guess, Ferrah might compensate by dodging,” she says. “Yup, that’s what I was thinking as well,” Madoka replied. “Well, since Kaiba is better than you then that actually makes you the third best duelist,” said Anzu cynically, drawing a reaction from Jonouchi, who then drops his head in shame knowing this to be true even though he doesn’t like to be reminded about it. “Thanks a lot, Anzu,” Jonouchi says with a dower tone. Flame Sagittario and Silver Scarab circle the stadium. Kenta casts a fierce gaze at Ferrah who simply smiles back. Ferrah’s bey has been dodging Sagittario since their match started. She reminds him of Hikaru when he first met her. Hikaru snickered at Kenta in the same snide manner that Ferrah is right now. Kenta, despite being defeated over and over again by Hikaru, refused to back down. It will be the same here. “You’ll have to do better than that if you’re wanna beat me, little guy,” Ferrah said mockingly. “I’m not done yet! Go Sagittario!” Kenta said back. Sagittario surges forward. Again, Silver Scarab avoids the strike and the several that follow. Sagittario whirls around for another. Ferrah has her Beyblade evade again. Sagittario follows suit. Ferrah looks on in shock and Kenta cheers when Flame Sagittario lands a clean hit. “Way to go, Kenta!” Gingka cheers. “Yeah, Kenchi!” Yu cheered also. “Go get her, little buddy!” bellows Benkei. Yami Yugi keeps his resolve but smiles in appreciation. “Alright! Hit her again, Sagittario!” On command, the yellow and orange Beyblade strikes again. Ferran tries repeatedly to avoid the attacks but Kenta is having his bey give chase, quickly changing direction and charging after black and silver Beyblade with no relent. “What? !” Ferrah is shocked. She had lost the advantage she had in this battle by becoming careless once again. She tries desperately to win back her edge by the yellow and orange beyblade stays right on her Silver Scarab. Ferrah is slowly growing more agitated. Neferiah, the taller woman dressed in gold and black Egyptian style garb, sighs heavily. “Ferrah, keep your head about yourself!” she says in a commanding tone. Ferrah looks over at her sister. “Drag this battle out no longer. Show him your true power and end it,” Neferiah tells her sister with a stern gaze. Ferrah flashes a smile and nods. She knows exactly what her older sister means. She then turns back to Kenta with a snide grin. “Okay, runt. Play time’s over. Time to show you what my Silver Scarab can really do,” she says. Kenta keeps his composure despite the proposed threat. “Bring it on! I’ll take on whatever you got!” he shot back with confidence. Ferrah scoffs and replies, “Have it your way.” Silver Scarab takes more hits from Flame Sagittario before it breaks away and comes back for another. Suddenly, Silver Scarab bursts forth and clashes with Flame Sagittario, showering sparks onto the stadium. Kenta reels back at the surprise counterattack. Ferrah grins and Silver Scarab knocks Sagittario back with a hard strike. “Sagittario!” Kenta called out as he watched his bey hit the stadium hard. Luckily, it retains its footing and remains spinning. He breathes a sigh of relief. Sagittario is still spinning which means he can strike back. “Alright Sagittario, let’s go!” Flame Sagittario charges forward with incredible speed. It quickly closes on Silver Scarab and looks to deliver another blow until Silver Scarab shoots to side to avoid taking damage and delivers it to Sagittario instead, drawing reaction from Kenta. However, Kenta was not the only one who was caught off guard by the sudden retaliation from Ferrah. “I was afraid of this,” said Yami Yugi. Gingka asks him what he means. He has seen this tactic used in Duel Monsters where one duelist would lure their opponent in by avoiding or defending against their attacks. They would even sacrifice weaker monsters just so they can gauge the abilities of their opponent and mount a counterassault. Ferrah has done that here to Kenta. “Ferrah was avoiding Kenta’s attacks to gauge his ability. She figured out how to avoid Flame Sagittario’s strikes,” he tells Gingka. “Are you sure about that? !” Gingka said concerned. “Observe for yourself,” Yami answered plainly. Still somewhat perplexed, Gingka returns his attention to Kenta’s Beyblade battle. Flame Sagittario whips around after it is denied a clean hit by Silver Scarab only to have the silver and black bey jump to the side immediately and deliver a powerful hit. Kenta grits his teeth. Taking a quick peek over his shoulder at the barrier holding Madoka, he knows he cannot lose if they want to save her and Yugi’s friends. He throws a glare at Ferrah who raises an eyebrow. “Let’s see you dodge this! Sagittario!” Kenta said firmly with determination. “Special Move! Flame Claw!” With a flash of light from its face bolt, Flame Sagittario breaks into a ground devouring sprint. The mini claw underneath its fusion wheel open up and the Beyblade become wrapped in fiery glow as it charges across the stadium like a comet. Sagittario closes the gap in a blink. Silver Scarab has not time to avoid the flaming special attack. Just as the two beys are about to collide, Silver Scarab sprints to the side just enough to allow Sagittario to blaze by it. Everyone, including those trapped in the barrier, drop their jaws in shock, awe and disbelief. “Too bad, runt. But this battle’s over! Silver Scarab!” Ferrah says. “Special Move! Shining Ray!” The spirit of Silver Scarab emerges. It is a giant gleaming scarab beetle that perches itself before emitting a blinding flash of light the envelops the entire stadium. When it fades, everyone, especially Kenta is shocked to see that Sagittario has vanished. Kenta scans the stadium carefully. “Uh, where’s Sagittario?” asked Yu. The question is answered when the Beyblade falls from above and bounces across the floor to the right of Kenta, who looks on wide-eyed and slack jawed in disbelief. With a satisfying grin, Osiris stands. “The winner of this battle is Ferrah,” he announces.